WELCOME TO WEB PAGES OF AUTOCENTAR-MERKUR d.d. The full company name reads: AUTOCENTAR-MERKUR dioničko društvo za proizvodnju, vanjsku i unutarnju trgovinu (joint-stock company for production, foreign and home trade). The abbreviated company name reads: ACM d.d. In informal communication, the abbreviation "ACM" is used, which was derived from the company name AutoCentar-Merkur. 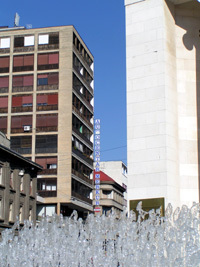 The seat of ACM is in Zagreb. The legal predecessors of ACM were founded in Zagreb in 1947 as the first companies in the automotive branch in Croatia. Today, ACM is organized as a business group of several trade and servicing companies in the Republic of Croatia and abroad, with branch offices in Russia, Ukraine and Byelorussia.